My family once tried to persuade me to get out of my addiction. At the time, I thought I was in full control of myself and laughed it off. That very laughter forced me into a miserable life. TIKAPUR, June 5: Kalpesh Kunwar of Tikapur has a black belt in karate. He also played football for the country's national team. While aspiring to be a good player, his life took a u-turn when he got addicted to drugs while still in grade 10. After the initial stage of addiction, he remained dependent on drugs for about ten years. Because of the addiction, lots of things have changed in his life. Not only did he lose the love of his family, he also lost respect from them and the society of which he was a part. People started looking down on him as he became the example of a gifted child gone wrong. Being looked down upon by family and society hurt him a lot. Yet, he was addicted so much that he felt that he could not live without feeding his addiction. But that was until he had a strong determination to live a life that he deserved. He decided that things need to change for his betterment and stopped feeding his addiction. He repealed the urge with sheer determination and help from his loved ones. After succumbing to addiction for about a decade, he got out of the habit four years ago. After that, he went to Saudi Arabia for employment and earned there for three years. Since returning home, he has been working towards raising awareness against addiction. By sharing his harrowing past, he hopes that others would desist from getting into addiction and will be saved from going through the torments he went through. “I lost lots of things after being addicted to drugs. My life changed its course completely. At the moment, I am trying to prevent people from falling in the same trap and through it regain my lost reputation,” he said. Katak Sodari also has similar story to share. Now 34, he dropped out in the final semester of Bachelors of Engineering from KIT College. “My parents wanted me to be an engineer and to fulfill that dream they sent me to Kathmandu in the year 2000. They had lots of expectations from me. But I spat in their dreams and fell into drugs addiction. That was a big mistake and now I'm left with life-long regret,” he said. Sodari spent 15 years in drugs addiction. But since the last 13 months, he has been staying clean from the addiction. With an aim to raise awareness about addiction, he has been actively involved in such campaigns since getting rid of his addiction. It was, however, not easy. “After knowing my family's plan to admit me at a rehabilitation center, I ran away from home and remained hidden in Achham district. 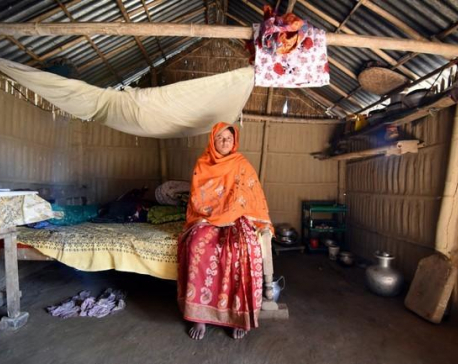 But my family searched me and admitted me at the rehabilitation center,” shared Rawal. As the time in the center passed by, he started distancing himself from the addiction. “My body started feeling lighter. Now, I have been clean for the past three years and eight months. I feel like I'm in heaven after suffering in hell,” he said. Another person sharing his story and giving inspiration to others is Roshan Kadaya. 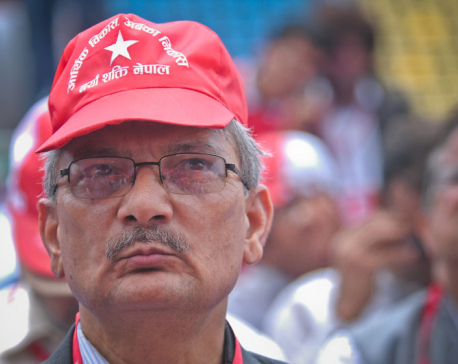 His parents had admitted him in a hostel in Nepalgunj at a very young age. He got into addiction when he was studying in grade six and just 13 years old. He remained addicted until 27. “My family came to know about my addiction. I missed my studies and started getting out of control,” he said. “My family once tried to persuade me to get out of my addiction. At the time, I thought I was in full control of myself and laughed it off. That very laughter forced me into a miserable life,” said Kadaya, who has been staying clean since the past five-and-a-half years. Since getting rid of the addictions, he has been actively involved in awareness campaigns against drug addiction. Today, he is a member of the Tikapur-based New Life Rehabilitation Center. He provides rehabilitation training to those who have been addicted to alcohol, brown sugar, tabs, and other drugs. At present, he is providing training to 13 people that have sought help at the center. These are just representative cases. 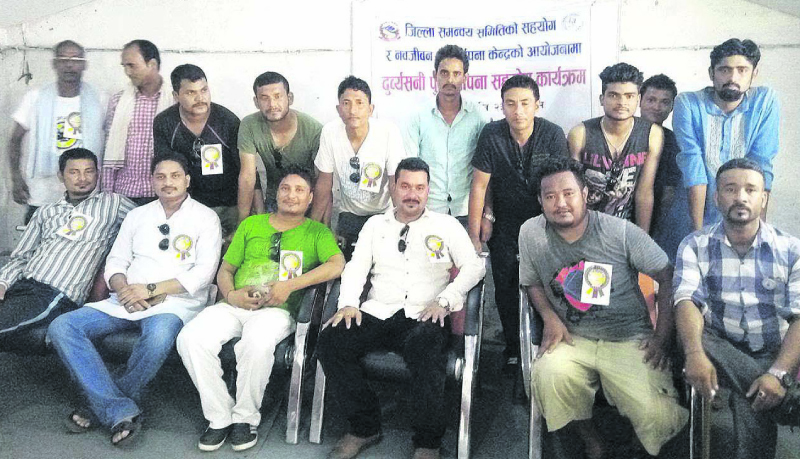 At least 20 former addicts are currently involved in such awareness campaigns in Tikapur. Over 100 youths are said to be addicted to drugs in Tikapur, while the number of alcohol addicts are said to be much higher here. Former drug and alcohol addicts participating in awareness campaign against addiction in Tikapur in this recent picture.